Fed Chair Jay Powell carries the torch of the “Fed put,” in other words, like Yellen, Bernanke and Greenspan before him. The stock market swoons, the Fed turns dovish. This biting criticism contains more than a kernel of truth. But it does not mean that the Fed won’t hike again. The Fed decided to pause because it thinks it prudent, and because it can. Inflation remains under control and—argues the Fed—so does financial stability. Therefore, slowing or even halting policy normalisation carries no risks—and the Fed can afford to wait. I agree that financial risks are broadly under control; but this points to more rate hikes, not rate cuts, in my view. Hear me out. US consumers are in stronger financial health than previously thought. Most importantly, our research shows that they are much less vulnerable to stock market fluctuations than they used to be. THE FINANCIAL HEALTH OF THE CONSUMER IS MUCH STRONGER THAN ORIGINALLY THOUGHT. THE US SAVINGS RATE REMAINS HIGH. Consider: Revised data from the National Income and Product Accounts (NIPA) show that the household savings rate has remained broadly constant (at a healthy [6%]) over the last five to six years, even as household net worth surged to a record high: 700% of disposable income. By comparison, when household wealth rose strongly in the run-up to the global financial crisis, the savings rate dropped from 6% to a mere 2%. The historical correlation between household net worth and personal savings has broken down after the financial crisis. In other words, the wealth effect is not as strong as it used to be: an increase in wealth no longer leads the household sector to meaningfully raise their consumption. Increased levels of wealth inequality play an important role here: greater inequality means the recent rise in net worth goes disproportionately to the benefit of richer households, especially as it has been driven by rising values of financial assets. Richer households have a lower propensity to spend more as their wealth increases. The 2006 housing bubble in contrast was much more egalitarian, benefiting a wide range of households that, in response, dissaved and consumed more. 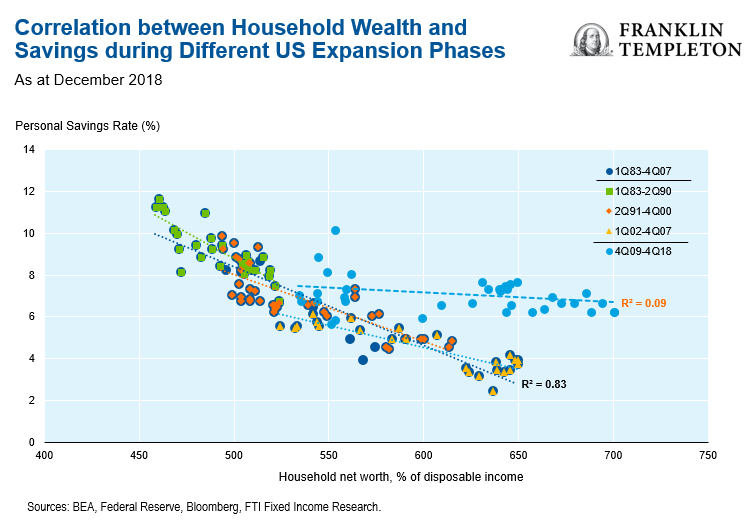 This lack of dependence on the wealth effect puts household consumption on a very sustainable footing, supported by rising income levels and less exposed to the gyrations of equity markets. 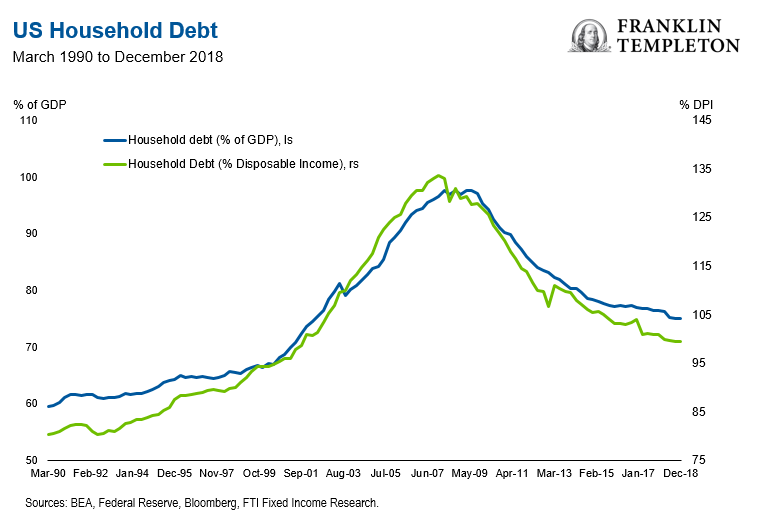 US consumers also face a considerably lower debt burden than before the financial crisis: household debt is about one-third below the 2008 peak, both as a share of GDP (gross domestic product) and as a share of disposable income. Household debt and mortgage debt service ratios have dropped to record lows, and consumer delinquency rates as a share of total bank loans are less than half what they were in 2009 (2.3% vs. 4.9%). IS THE WEALTH EFFECT DEAD? SINCE THE END OF THE GREAT RECESSION, THE WEALTH AND SAVINGS RELATIONSHIP IN THE US HAS BROKEN DOWN. These data convey one clear message: the Fed has little reason to fear that further monetary policy tightening will harm household consumption. 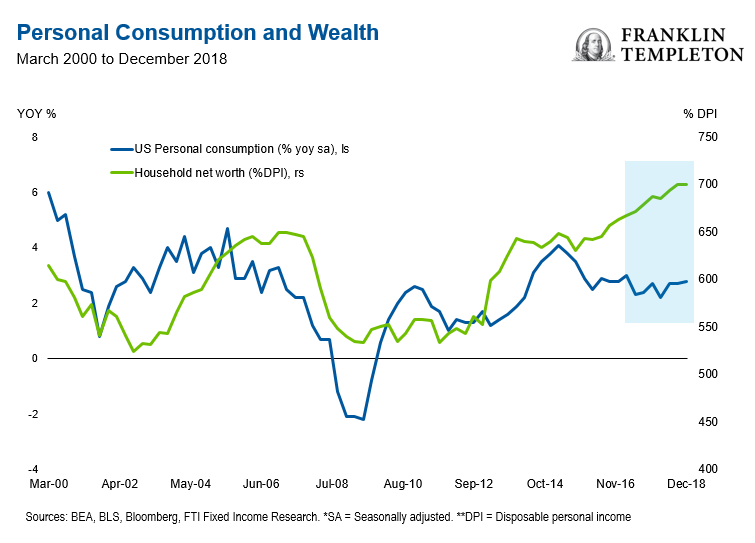 Consumers enjoy high net wealth levels, high savings rates and low debt service ratios, and their consumption decisions don’t seem to react much to changes in net wealth, especially if driven by stock prices. The Fed can hike some more, and consumers will take it in stride, even with some correction in equity markets. The Fed said it wants to be prudent and take the pulse of domestic growth, the global economy and US financial conditions. Take the robust financial health of US households together with a red-hot labour market feeding healthy wage gains, and you get a very resilient outlook for private consumption—the primary domestic growth engine. Global growth has weakened somewhat, but Europe’s economy still marches above potential and China’s runs at a respectable 6% pace. Barring any major shocks, we are looking at a very moderate deceleration in global growth, not a sharp slowdown. As for domestic financial conditions, they had tightened mostly because of the drop in equity markets, which have since turned around—and which seem to have limited impact on consumption, as shown above. In the coming months, I expect the global economic outlook to prove more resilient than markets now predict, making equity investors less prone to panic. I believe the Fed will then deliver two more rate hikes—because it would be the prudent thing to do—and because it can. Ultimately, economic fundamentals will drive the show; that’s what we should be watching. View a .pdf of this material with more analysis here.